Thanks Deadly GU, over all I am happy with the job, considering my budget I had to play with. I have a couple of things I am not happy with, the amount of boost is not quite as high as I expected, it is just getting to the 4lbs. I was hoping to get closer to 4.5lbs this can be fixed with a smaller pulley, but I will run it as it is for now to see how well I goes. A video of the Nisota pulling up a hill so you can hear how it sounds from inside. Do you notice an decent increase in power with the current boost level? The Rig I think it sounds OK as well, you can hear the Supercharger as the revs and boost come on, but cruising is sound no difference than it always did. Dhc4ever yesterday I hooked my camper up and tested how well in now pulls it oh a range between Atherton and Herberton, there is a noticeable difference, you can ease up and it will now come back to power easily once you put the foot down again. The big difference fo me though in how cool the engine is running with the viscus fan, over 10deg difference up the same range. I now have to look at the tuning though, it is leaning off under load. I think the after market fuel regulator is not up to the job, I have just refitted the factory regulator on and I will see if it is better. I think I need a 1/1.9 not 1/1.1 ratio fuel regulator. I thought I should update how well the supercharger is running. On the engine temp side of things , it is running better than I ever hoped, even towing my camper up the Atherton, Herberton range, the engine is only getting to 82deg, this is well down on the system I had with the electric fans, and it is pulling it so much easier. You would not think it is the same engine. on to the engine, but this has not helped a lot. I don't think it is rising the fuel pressure enough to over come boost, as it is only rising an extra 4lbs above standard. After doing a lot of reading on the 1uzfe engine with a supercharger, this has surprised me a little as most people run 6lbs of boost and don't have a problem. I think I am having the problem due to the weight difference from the cars compared to my Nissan, around 1ton at a guess. I have been taking some advice, and I think the best way is to now upgrade the fuel injectors, from 255cc to 315cc, this is often done when using a higher boost than I am running. I can buy refurbished injectors out of the states for around $250 delivered so this may be what I need to do. 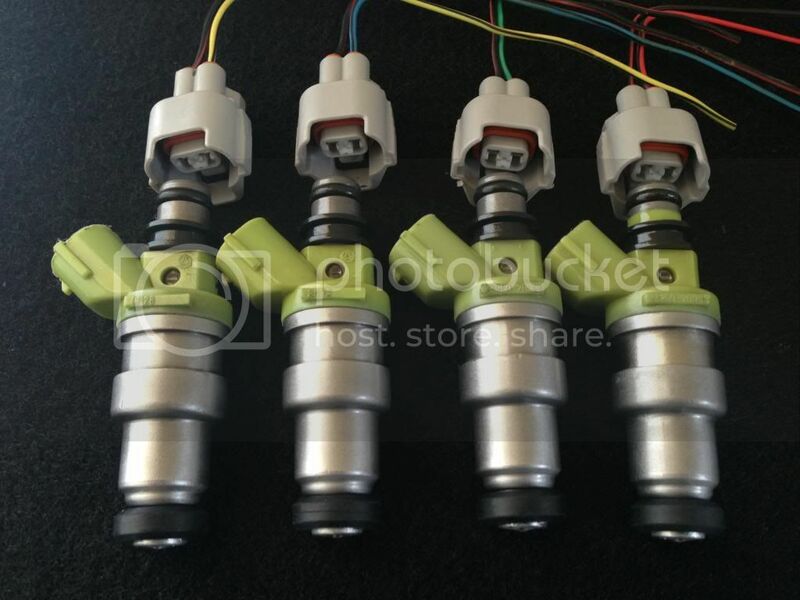 Not my photo, but these are the type of injectors I need, Denso 23250-70080 as they are a direct fit. SirGollum I hope not, the ecu is a self learning ecu, so as long as I am within its parameters it should be right. I know when bigger boost is run on these engines you need a piggyback unit or a new stand alone engine ecu, and then just use the original ecu to manage the transmission. If I find it starting rich I can always remove the cold start injector, this is also normally left out when fitting superchargers on 1uzfe engines, the manifold manufacturer told me they rarely refit it when they do the conversion. Great to catch up on this thread. Had no idea you had done so much let alone fit a super charger! Stupid subscription fault keeps stopping the notifications. Glad to see you are doing so well still mate. If you ever get cooling problems you should shorten the fan shroud length. I used to think that fully covering the blades is the best thing but it fires the airflow straight at the block and slows it down. The experts say 1/3rd in and 2/3rds out will cause the air flow to be pushed past the sides of the engine and increase the flow through the radiator as a result. The highest air velocity is at the blade tips and having it too far in actually traps it there. Gojeep, yes I am still playing around, I have called it my hobby. I also have found the 1/3 2/3 is the way to go, I have left the very top of the shroud longer just to keep it tidy, but I think it will be ok now for the cooling side as per my next post. Time for an update, I have been side tracked since coming home from the Townsville Weekend. I contacted Bullet the manifold manufacturer, to ask for some advice, they were surprised I had the problem, but they recommended me to try 98octain fuel. This is not easy as the nearest supplier is a half hour drive to Mareeba. Bullet also has a piggy back system for the ecu, this might be a possibility but I will see how I go for now. I wanted to give the Nisota a good run down to Townsville toeing my camper so I filled the front tank with 95octane fuel for the run down. This trip was a test of a few things, as on previous runs to Townsville coming home up the range my engine temps run around 95deg but got as high as 102deg on a couple of the steep climes, although only for a short time. Going to Townsville the highest temp I got was 82deg, inlet manifold temps only got to 42deg. I found I could drive around any engine leaning of just by lifting the foot slightly, as for some reason it only appeared around 2lbs of boost. For the return trip I filled with some 98octain fuel, this is running much better than the 95. On the return the highest engine temp I got was 84degs. The inlet manifold temp came no higher than 45deg, this is only around 15deg higher than ambient air temps. Performance wise I was very happy, plenty of power through the rev range, the highest boost pressure I saw was 5lbs coming up a hill. On coming home, on reflection I have decided to remove the water injection, I am not getting inlet temps high enough to keep it, and it does not appear to help. Last edited by jclures on July 29th, 2013, 1:32 pm, edited 1 time in total. Sound like a good result. My new injectors arrived while I was in Townsville, I decided as I was fitting them I would remove the cold start injector as I thought that it would become irrelevant with the bigger injectors. The grey units are the standard ones, the new units arrived with all the rubbers to fit so I was not a big job. Once fitted I found no difference once the ecu had a couple of restarts and test drives, although I thought on start up if might have been richer, but I am not convinced this is a good fix with my current setup. As I have not achieved what I was after I am for now going to plan B for now. 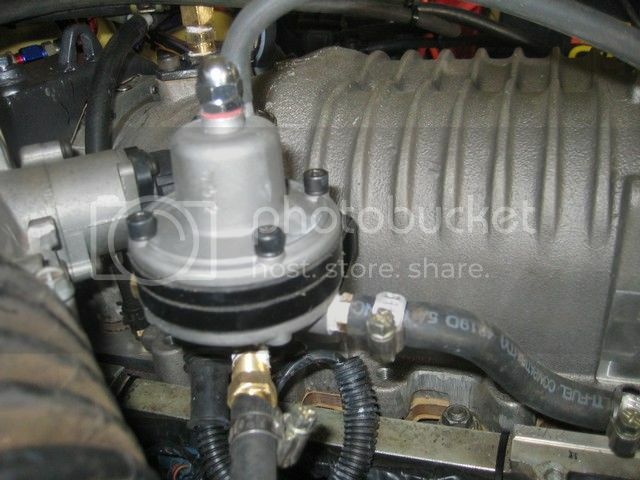 I have refitted the standard injector back in and brought a 3.25pulley. It will bring the boost back to a maximum of 4lbs, not the 5lbs I found I was getting under full load. This I think will be a temporary fix as I might look into what ecu options I have including changing it completely. If I do this the new ecu will need to be a plug and play unit, which can control the transmission as well. It would also need to allow the better use of the larger injectors I have. 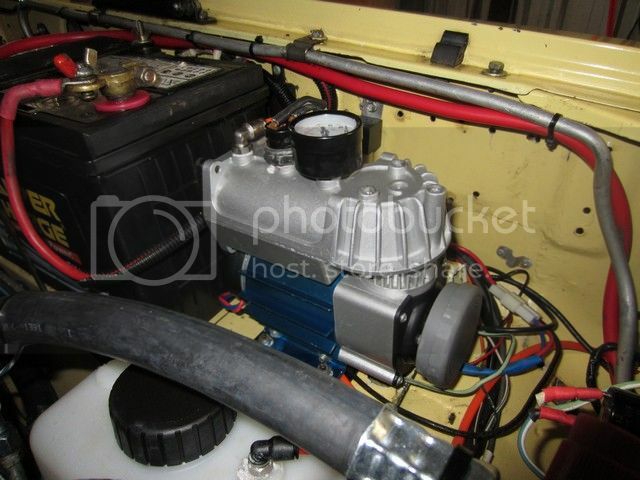 As I have now removed the water injection I have a decided to fit a air compressor into the free space in the engine bay. The compressor is not a big unit but but beggars can not be chooses as it was given to me by my brother, as he had fitted a bigger unit in his Nissan. Now all I need is the air locker to go with it. Time for an update, I have ordered a Wolf 550 plug and play wiring, I am not sure when I will receive it though as they have to make it fit my ecu plugs. I sent them one of my spare ecu to make the plug. This will mean I also will need to be put the Nisota on a dyno to set the transmission shift points as the Wolf unit controls the transmission as well. Another issue I have had is I had a air filter collapse, this was a genuine Nissan filter, so I have gone back to after market filters, as they have a wire mesh on the engine side supporting the paper element. What this tell me though, it is to small, so a new air box will be needed, I will also upgrade the snorkel from a 3” to a 3.5” unit to fit the new air box. I have read everything I can on air filters air filter box designs I can find since my last post, it has left me a little air headed, and lost. So, I will just make what I want and see how it works out. 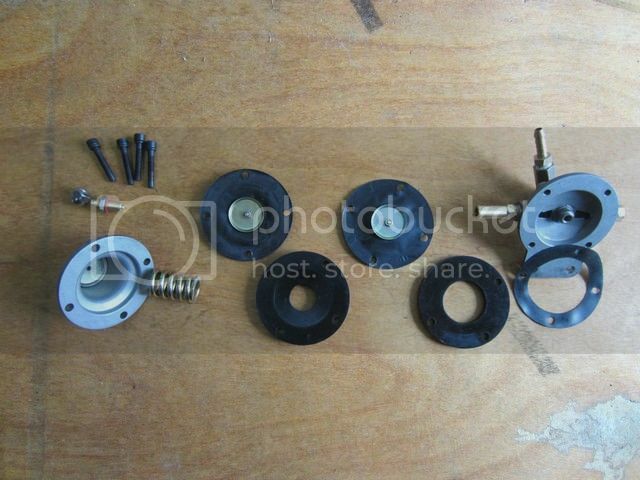 I have ordered the 9” filter from CBM, and collected the rest of the bits from Ebay and locally. Now I just need for the pod to arrive. Wolf and I have had a talk, and after me sending them the pinouts on my ecu they say there won't be a problem, although finding someone in Cairns that has the ability to tune it on a dino is a different matter. I might have to take it down to Townsville as Wolf has a agent there who can tune it.